Pest Solutions are experts in pest bird control, and we have a wide range of effective bird control and deterrent systems at our disposal. This allows us to exclude pest birds from all types of buildings and structures. There are thousands of different species of birds in the UK. Most of these rarely come into contact with humans- but there are a handful of breeds which can cause real problems for us. Feral pigeons, gulls, starlings, and the main culprits, but there are plenty more pest bird species out there, too. However, dealing with an infestation of pest birds is easier said than done. Birds scare easily, but they will soon be back, and in greater numbers, if left to breed unchecked. Rather than letting the problem balloon until it has a devastating impact on your home or business, it is far better to take action as soon as possible- and at Pest Solutions, we have all the pest bird deterrent systems needed to do just that. As pest control experts with many years of experience, we have a whole host of different pest bird deterrent systems that we can draw on. From bird spikes and nets that present a physical barrier to would-be pests to audible and visual scaring systems that will frighten them away, our technicians know the very best ways to keep pest birds away for good. If need be, we can even fly a Harris hawk around your property to show other birds that they should stay well away. There are a wide range of different factors that come into play when assessing a pest bird problem. 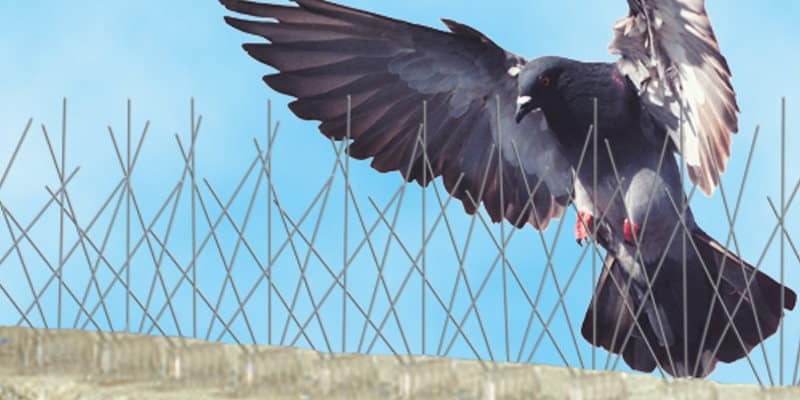 From the species which is causing the issue to the unique shape of the structure in question, a lot of planning and expertise goes into every single one of our pest bird deterrent systems. At Pest Solutions, we don’t use a one-size-fits-all approach. Instead, we are delighted to offer a FREE survey to anyone experiencing issues with pest birds affecting a building or structure. One of our bird control specialist surveyors can come out at a time that suits you best, and provide you with expert advice on your best route forward. They will assess the current bird issue to establish the species and the most effective and humane method of excluding the birds from the area. That way, we can reduce the damage done to buildings and structures and reduce public health risks dramatically. Our expert Pest Bird Control Specialists can help you find the right solution to solve your bird control issue today. With so many different methods to choose from, you can be certain that our professional pest control technicians will be able to deal with any pest bird problems you might be experiencing. Whether it’s tackling an existing infestation or keeping any pest birds away from your property in the future, we can get the job done for you. As full, active members of the British Pest Control Association (BCPA), we’re committed to upholding the highest possible standards and work hard to offer an unparalleled range of pest bird deterrent systems. As pest bird control experts, Pest Solutions are perfectly equipped to assist with all aspects of pest bird control and bird deterrent systems. Simply call Pest Solutions on 0800 027 2555 to arrange a FREE survey or a service call out. Whatever pest problems you might be facing, you can rest assured that we will deal with them effectively and discretely.